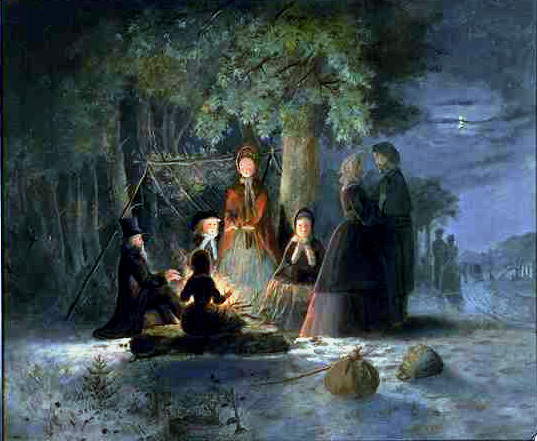 What follows is the first in a projected, short series of posts that will review the chromolithograph’s own history; its testimony to the antebellum appearance, development, and self-image of Fredericksburg; and its documentation of the wartime landscape of 1862, six years into the future–little changed in some aspects from the picture of 1856 but altered markedly in others. 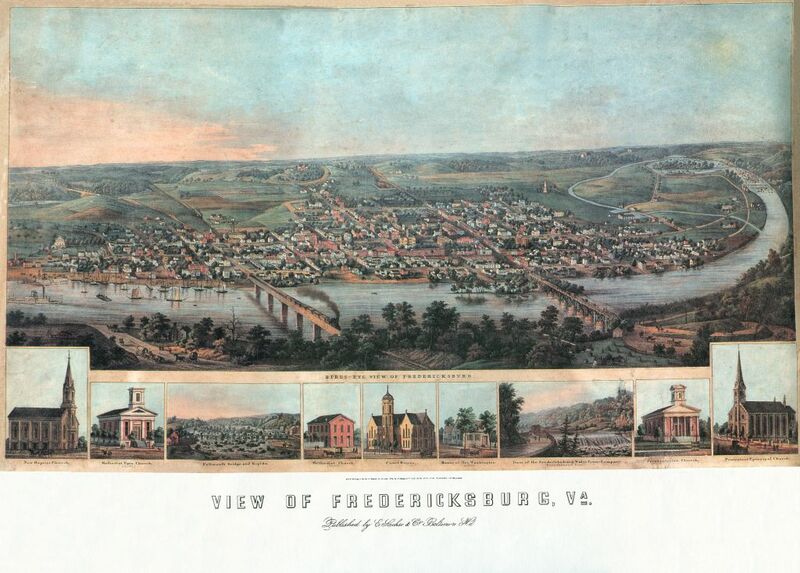 Edward Sachse & Co. of Baltimore published View of Fredericksburg, VA in 1856. Sachse & Co., which had already produced panoramic views of Alexandria and Washington, D.C., as well as of Baltimore, began work on the Fredericksburg picture by dispatching an artist, or artists, to the town. Judging from John W. Reps’ book, Views and Viewmakers of Urban American, Sachse artist James T. Palmatary was probably responsible for walking Fredericksburg and its outskirts and preparing at least some of the reference sketches in 1855 and/or 1856. These were then compiled as a master drawing, which back in Baltimore was etched onto smoothed pieces of limestone for printing. Preparation of the master drawing had involved a key rearrangement of data: re-picturing the human’s-eye, ground-level drawings of Fredericksburg and its individual buildings from a single, high “bird’s-eye” angle, to show the complete town while maximizing information about individual structures. The final perspective for View of Fredericksburg, VA looked across and over the town from a point just across the Rappahannock River and hovering above Stafford Heights, about a half mile from the RF&P Railroad bridge over the river, and a quarter of a mile or so from the farmstead that occupied the site of George Washington’s boyhood home. Fast forward from 1856 to December 1862: artist Alfred Waud positions himself beside the ferry landing to sketch Union bridge-builders under fire at the Middle Pontoon Crossing. A week later, following the defeated Federals’ retreat across the river, some of them convert “an old cherry-tree” on or near Ferry Farm into “all sorts of crosses, pipes, rings, etc., that can be sent away by mail” as mementoes of George Washington. This is the final installment in the documentation of Aquia Church’s Civil War soldier graffiti. Previous posts on this subject can be found here. In late November 1862, Union General Ambrose Burnside brought his Army of the Potomac to Stafford County. Intent on pushing south toward Richmond, delays and logistical problems plagued Burnside’s plans. His army remained idle as events developed that eventually resulted in the December Battle of Fredericksburg. 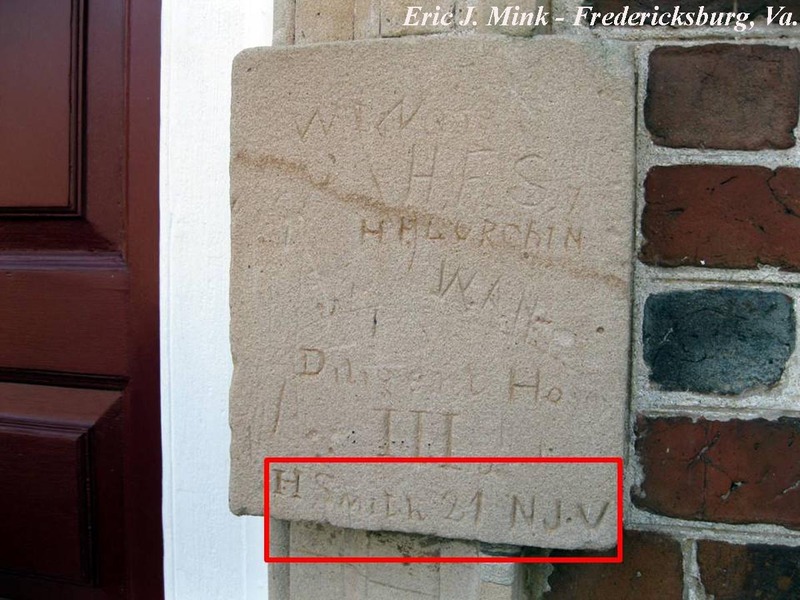 It was during this waiting period that at least two soldiers from the 6th Army Corps visited Aquia Church and added their names to the building’s soft sandstone quoins. The 21st New Jersey Infantry was a short term regiment. Its members enlisted for the brief period of nine months. Organized in September 1862, the regiment reached Stafford County on November 18 and went into camp along Aquia Creek. Some of the men in this regiment attended services at Aquia Church. It is likely that at this time “H. Smith” of the 21st New Jersey left his name on Aquia Church. It can not be said with any certainity who Smith was, as there are three potential candidates for this soldier on the regimental rolls. The first two, Private Henry Smith of Company A and Corporal Henry C. Smith of Company B, both served their full nine-month enlistment with the 21st New Jersey and mustered out of service on June 19, 1863. The third candidate was not so lucky. Humphrey Smith was a 29-year old laborer from Monmouth, New Jersey. He enlisted on August 27, 1862 and a month later mustered into Company E of the 21st New Jersey Infantry. He survived the Battle of Fredericksburg only to succumb to “brain fever” near Belle Plain in Stafford County on March 22, 1863. Originally buried at Robert Lee’s farm, his remains were removed after the war and buried Grave #6132 in the Fredericksburg National Cemetery. 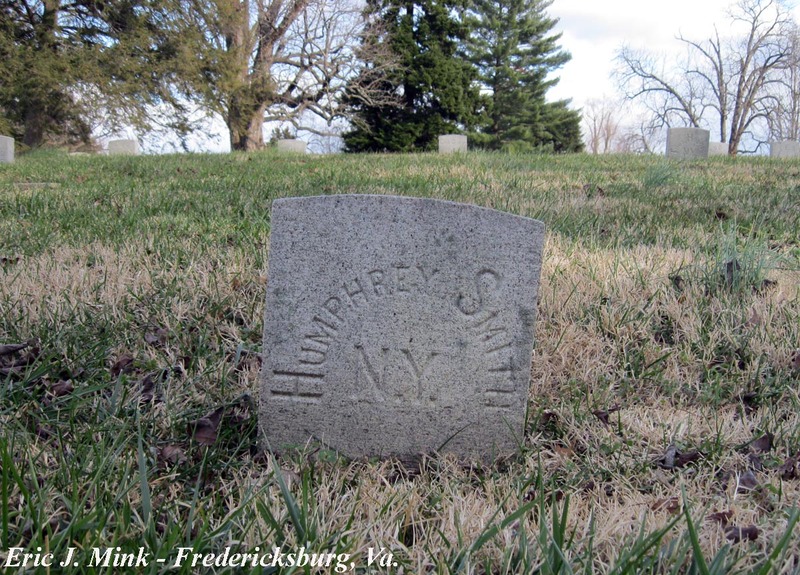 Grave of Humphrey Smith in the Fredericksburg National Cemetery, which erroneously identifies him as from New York. Four days following the 21st New Jersey’s services at Aquia Church, some members of the 6th Maine Infantry paid a visit to the sanctuary. Corporal Benjamin Thaxter of that regiment noted in his diary entry for November 27 that he and his sergeant went “to see an old church that was built in 1757.” Private William A. Jellison also visited the church around this time and opted to leave his lasting mark on the building. Here is a portion of our latest piece of original art, developed by Frank O’Reilly and executed by artist Mark Churms. This will be used in the new exhibit we are planning for the Fredericksburg Battlefield Visitor Center, and also likely on a wayside exhibit atop Marye’s Heights. 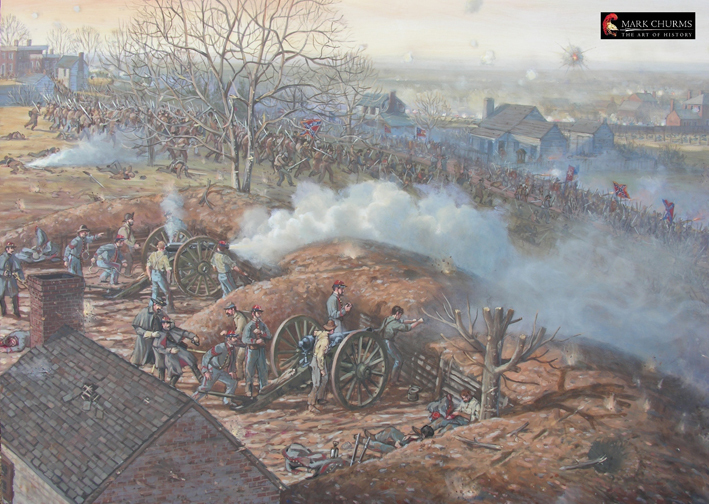 The image shows guns of the Washington Artillery firing over the Sunken Road, into the killing field beyond. That’s the Stephens House and Innis House at center and left, with the brick Stratton House beyond. The piece will eventually be made available for sale by Mr. Churms. We like it and thought you might be interested to see a little slice of what’s going on hereabouts. Copyright Mark Churms. All rights reserved.